If it’s between about mid-April and late June in Germany, it’s Spargelzeit! 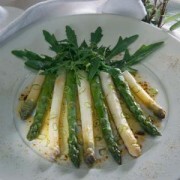 It’s the time of the year when Germans go mad for the tender white spears of asparagus, enjoying them in myriad dishes. Get into the spirit! Celebrate Spring and Spargelzeit with these authentic German asparagus recipes.